When designing my Child Size Slouchy Hat, I had so much fun with the pattern and the hat turned out so beautiful, I knew I had to make one for me too. 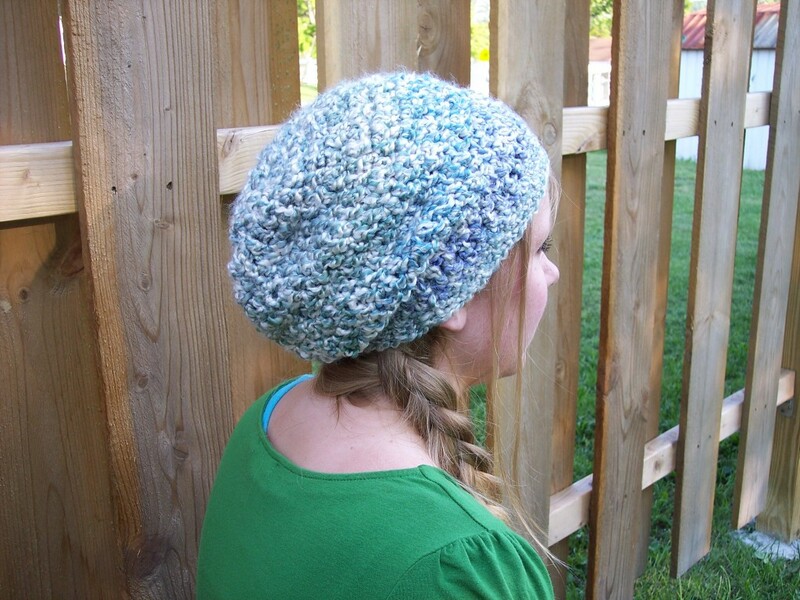 This free pattern is very easy to follow and its simply the perfect slouch hat! Round 1: Magic Circle, CH 3, 9 DC inside ring. Join to top of CH 3. Round 2: CH 3, DC in same stitch, 2 DC in next 9 stitches. Join to the top of CH 3. Round 4: CH 3, DC in same stitch, DC in next 2 stitches. ** 2 DC in next stitch, DC in next 2 stitches. Repeat from ** 8 more times Join to top CH of CH 3. Round 7: CH 3, DC into each DC around. Join to top of CH 3. Round 8: CH 3, DC in same stitch, DC in next 4 stitches. ** 2 DC in next stitch, DC in next 4 stitches. Repeat from ** 8 more times Join to top CH of CH 3. Round 9: CH 3, DC into each DC around. Join to top of CH 3. Round 12: CH 3, DC into each DC around. Join to top of CH . Round 14: CH 3, DC into each DC around. Join to top of CH 3. Round 15-20 : CH 1, SC in same stitch and in each stitch around. Join to CH 1. BuyCostumes.com is a great way to save money on store-bought costumes! A friend of mine is just starting to get her hair back… she created lots of fun hats while going through the chemo. Which honestly, this yarn is sooo soft and comfy it would make an awesome hat to keep you warmer and cozy this fall <3 I wish you the best with what you are going through. Sending lots of love, light and prayer your way. Hi Corina, just found your site and love, love, love it! And kaz, prayers and good thoughts your way! K I really am glad she did. 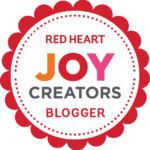 You have some fun/nice projects.ath B on Crochet Talk sent us to your blog. 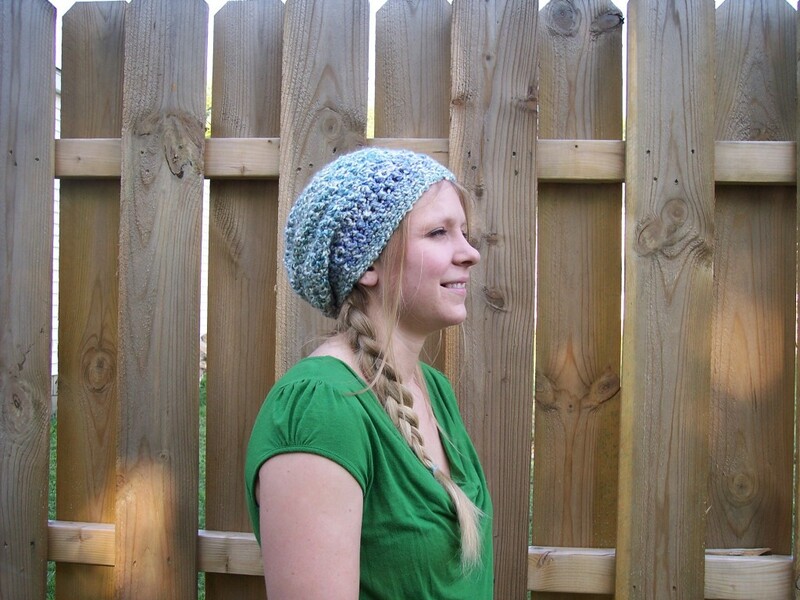 Corina – Love, love, love this hat! I just made it up this afternoon with Lagoon Homespun. Perfect, thanks for this amazing pattern. The color of your hat brings out your beautiful eyes – good job. kaz – Healing thoughts and wishes are sent your way and your new hair will look even better with this gorgeous hat on it. I just made this hat last night, I used Bulky yarn and the hook size provided, and my hat is really stiff. I am a new crocheter, so any suggestions? Do I make the stitches too tight, or should I use a bigger hook? It fits me, it just doesn’t really slouch much, it is like a mushroom! Thanks for any help!! Also, do you not Join after Rounds 3, 4, 6, 8? I was just curious since it doesn’t say so after the round. Thanks again!! Thanks so much for pointing that out to me. Yes you do join. I fixed it to say so. I used lion brands homespun yarn. Its not as stiff as most bulky weight so that might be your problem. Do you have access to lion brand homespun? I haven’t tried to make this with any other yarn so I am not sure how it would turn out. Thanks so much for this pattern! I just moved to Germany and I was not prepared for the cold so I ran out and bought a skein of homespun. After looking on Raverly I found your pattern and promptly crochet this in one night. Thanks to you my head and ears are staying nice and warm! I just made this hat and it looks like it would fit an infint. I am a bit confused becasue i thought the directions were for an adult. At this point i am not sure how to make it actully fit me because i love the way this hat looks. HELP!!! What kind of yarn are you using? are you using the same yarn and hook? This is the adult version. Thanks so much. I’m having fun learning, I hope it turns out! 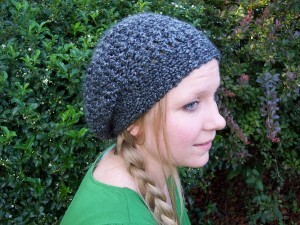 I love the look of this slouchy beanie! I’ll have to buy a skein of the yarn as soon as possible so I can make it! Thanks for a terrific crochet pattern! I’m a UK crocheter and I’ve converted your US DC into UK TR and I’ve still ended up with a child sized hat from following this pattern. I’m using a 6.5mm hook and chunky yarn so I’m not sure what’s gone wrong? It’s a shame as I was hoping to make this hat for my mother for Christmas. Do you have access to Lion Brands Homespun yarn? Its chunky yarn but works up completely different than most other chunky yarns. i really loved the hat pattern! it looks great! How many yards of yarn you use? I have one skein of 81 yards, is that enough? I used around a half of a skein, maybe just over a half. But make sure its lion brands homespun or another brand that is like homespun so it will work up the same. A lot of people have tried other bulky weight yarns but its not the same. I am so excited to try this but….homespun SCARES me :-)…patterns usually say “2” strands together which I do not see on your pattern. Ok– I CAN DO THIS!!! I have about 20 skeins of homespun that was given to me so I am going to trust your beautiful instructions for this menopausal mom!!! I’m just above a beginner…. Yup, this one is just one strand. Don’t be scared! And if you have problems with the yarn snagging on the hook just keep going and you will get used to it. This hat was the first time I had used it too. The first 2 rows were scary when learning the yarn but after that I got used to it. You can do it!! Will love to see your finished work too!! I love this hat, but tried a different yarn and it turned out too tight so I took it apart. I want to try it again, but also think I was doing something wrong beginning with round 10. When it says to DC DEC in next 2 stitches, do you actually mean next 4 stitches since a DC DEC uses 2 stitches to make one?? Mine turned out with “bumps” on the hat. Really, really want to make this work! Oh sorry for the confusion! I do mean you use two stitches to make one DC DEC.
With the Chain 3, you will not DC into the same stitch because the CH 3 is like a DC itself. And round 7, you do DC into each DC but you do not skip any stitches. I don’t know if I did something wrong, but my hat seems big. Is it supposed to be kind of snug? Mine seems like it could just fall off. I followed the directions very carefully. I was concerned about the round where I DC into each DC…after the round that contains the DC Decrease. I did a DC in those as well. Ugh, this is my fourth time attempting a slouchy beanie and they all keep coming out huge. 🙁 what am I doing wrong? What kind of yarn are you using? You could do the last round as FPSC (front post single crochet) and it will tighten it up for you. The DC in the rows following, or on top of those DC DEC stitches should only have one DC above every DC and DC decrease. That’s how the hat gradually becomes smaller. 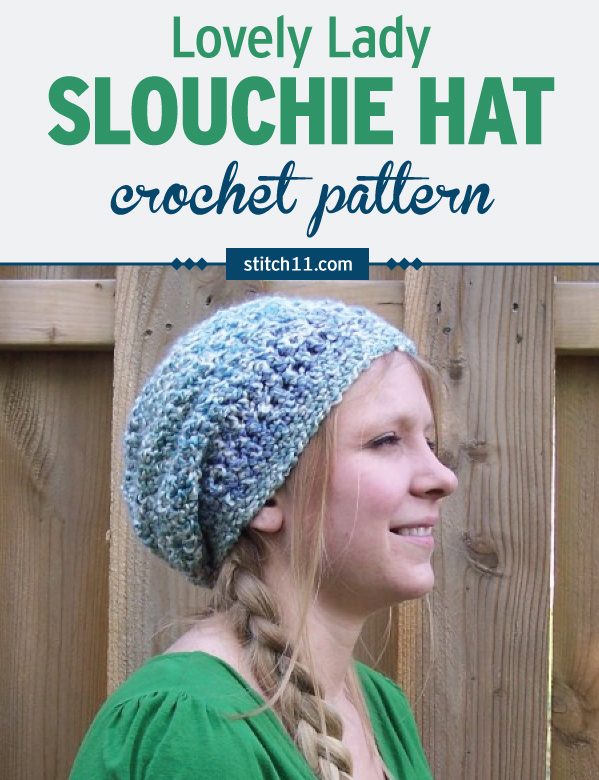 If your hat is too big all around, including the edging, and you’re sure you understand the pattern, try a smaller crochet hook. What worked well for me was using a 6.5 hook for the body, and a 7.0 hook for the last 6 rows. It came out perfect. I have a skein of gorgeous soft alpaca yarn that I want to make a slouchy hat. It is not chunky yarn. Do you think your pattern would work for my yarn? I’m not sure.. I haven’t ever had the chance to work with alpaca. I figured it out after an ah-ha! moment. I originally made the hat with a 6.0 mm hook, and the hat was too small. I redid the hat with a 7 mm hook and it was too big. I went to Michaels , purchased a 6.5 mm which was working great, but the last 6 rows in sc made the edge too snug on my head. I redid only the last 6 rows with a 7.0 mm hook and the hat is perfect and beautiful. Thank-you for the pattern. The only thing missing here is a guage, I crochet and knit very tightly. Made one with suggested yarn and hook size, would not fit an 8 year old neighbor girl. Made a second with lion brand super bulky and a size N hook and it is a mario hat. Thank you. I love this pattern, but is there a printable version available? Incredibly happy to have come across this pattern! Most ‘slouchy’ patterns have not come out slouchy at all but this was perfect! It makes a huge difference to use the suggested yarn when following patterns and this was no exception! Thanks!